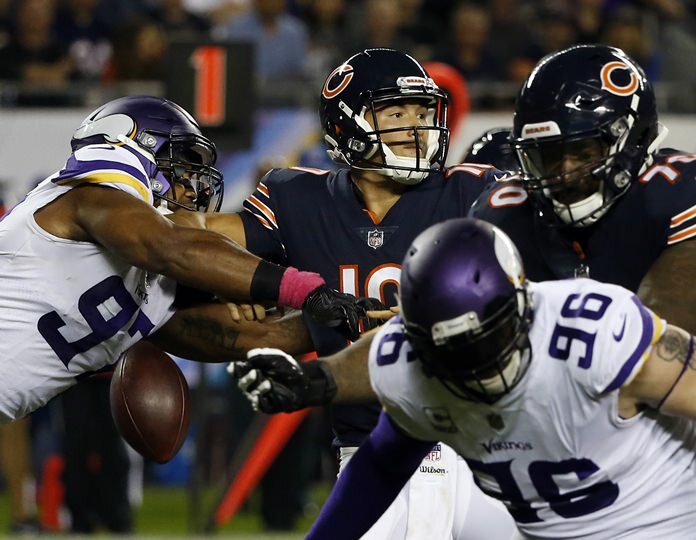 Chicago (AP) — Case Keenum led three second-half scoring drives in relief of Sam Bradford, and the Minnesota Vikings spoiled prized rookie quarterback Mitchell Trubisky’s debut with a 20-17 victory over the Chicago Bears on Monday night. The Bears simplified their offense for Trubisky, with fewer receivers and extra blockers at times. But he still showed the mobility and arm strength that convinced general manager Ryan Pace to trade up a spot with San Francisco to grab him on draft night. Jordan Howard ran for 76 yards. Pat O’Donnell threw a 38-yard touchdown to Benny Cunningham on a fake punt. Floyd had two sacks. Minnesota was leading 3-2 when Keenum hit Kyle Rudolph for a 13-yard touchdown midway through the third quarter. The Vikings celebrated by playing duck-duck-goose in the end zone. The Bears lined up to punt on a fourth down at the Minnesota 38 on the next possession. But O’Donnell passed to a wide-open Cunningham, who spun around Marcus Sherels on the way to the end zone, cutting it to 17-9. Chicago used another trick play to tie it. The Vikings’ Andrew Sendejo tipped a pass right to Zach Miller in the end zone for a 20-yard touchdown. The trickery came on the two-point conversion. Trubisky handed the ball to Howard, who gave it to Miller. Miller then pitched it to Trubisky, who ran it in on the right side to tie it at 17-all with 12:24 left in the game. The Vikings released running back Stevan Ridley after only five days to make room for receiver Michael Floyd, whose four-game suspension from a drunken driving arrest with Arizona last year expired. Bears: LB John Timu left with a knee injury early in the third. He was hurt trying to tackle Latavius Murray and had to be helped off the field. … LB Willie Young (triceps) and cornerback Marcus Cooper (back) were inactive. Vikings: Host Green Bay on Oct. 15. Bears: Visit Baltimore on Oct. 15.